Jeremy Gardiner and Chris Smishek had already beaten up another man before descending on Asher. The second victim recovered from his injuries. At the time of the incident, the teens were quoted as saying they had "thought he was a fag." The sexual inclinations of the victims in these beatings is unimportant. What is far more important is the guilty minds of the assailants who both come from well-connected Saskatchewan families. Gay bashing in Saskatoon has been and continues to be a frequent occurrence. When the phenomenon was being brought to light in Winnipeg and other Canadian and U.S. cities a decade or more ago, it was not raised here. The same media managers reported on Satanic abuse charges salaciously and slavishly gobbled up the juicy tidbits offered by the hysterical promoters of the false allegations. The accused, were after all not well-connected -- in fact, many were demonstrably low-class. When policemen were charged in the Martensville affair, the media took a bit more notice, although the events surrounding the most expensive criminal trial Saskatchewan has yet run were most certainly destructive to everyone concerned. Anti-homosexual bigotry has been around Saskatoon as long as I can remember. When I first went to university to study English, Dr. Peter Millard was expected to succeed the current head of the department but was passed over because he was gay. After an acrimonious decade, during which those who had rallied to his defence and had been mollified by an arrangement of rotating heads, he finally got the position. He didn't want to talk about it. A cultured and gentleman, Dr. Millard passed away this winter. I have heard so many personal testimonials from people who have been physically brutalized because they were gay that I have no difficulty stating that Saskatoon has a serious problem. Several of the incidents I have learned of were committed by police. So, alongside the First Nations people (15% of Saskatoon) we have the gay community which is dumbstruck and terrified, living in continual fear. I have tried very hard to get some of the victims to come forward, especially the ones who have sought redress and ended up doubly brutalized, but they are too scared. The movie Norma Rae has a haunting theme song with the recurring lines: "And sometimes what's good gets a little bit better, and sometimes what's bad get's gone." I occasionally find myself humming that piece but when I come to the last line, I find myself changing it to "and sometimes what's bad gets worse." That about sums up the decline of this beautiful city over the last decade and a half -- from poem to ugly cliché. Judy Asher was glad she wasn't home Thursday when the message from the National Parole Board arrived, telling her that the man who took her son's life less than four years ago is getting out of jail to work in Alberta. "I'm just glad that he's not going to be here in the city," she said in an interview. "You think that you've prepared yourself, and then well . . . all I guess I can say is that we are upset, but that's just natural. We knew that it was coming, but it's still just a shock." Scott Asher was just 23 when Jeremy Gardiner and another middle-class teen, Chris Smishek, both 17 and drunk, descended on him with a red oak cricket bat in the Broadway area one night in early June 1998. An hour before, they'd launched a similar random attack with the same paddle on another man in City Park. The other victim survived his head injuries. Asher went into a coma and died three days later. The memories are still close to the surface for his family. "You go through the same emotions every time," Judy Asher said. "Maybe other people think we should be hardened to it by now, but you aren't." 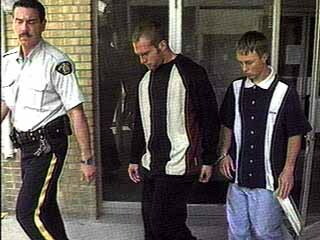 Charged with second-degree murder, Gardiner and Smishek both pleaded guilty to manslaughter in a plea bargain in 1999. 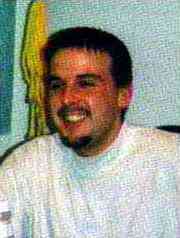 Smishek was ordered to serve 3 1/2 years, and was paroled in 2000. Gardiner, who delivered the fatal blow, got 4 1/2 years. He would likely have been released by now if he hadn't absconded through the perimeter fence at the Saskatoon Correctional Centre with six other inmates in fall 2000, then taken part in a break-in and car theft. He pleaded guilty to those charges as well, receiving an additional three months for the escape. His sentences for the break-in and theft amounted to "time served." After a hearing Thursday morning, the parole board agreed to release Gardiner, now 20, on day parole as soon as space is available at a halfway house in Red Deer or Calgary, where he plans to work in a lumberyard. "Your prowess at fighting was encouraged by a previous stepfather and proved useful to your hockey team, where you met your co-accused," the board noted in its decision. "Since your return to custody (after the escape) your behaviour has been acceptable although you were reported as having a tendency to gravitate to people who could offer reinforcement and/or protection . . . the month-long period of solitary confinement following your recapture allowed you to seriously re-evaluate yourself." Gardiner told parole board members that "constant contact" with a psychologist since his recapture enabled him to change his attitude. The board imposed an order that he abstain from "all intoxicants" until his full sentence expires in 2004. In the net we found more news about the murders than about the victim!